Dr James Evans, a healthcare researcher at SMTL, has had a paper published in the Pacing and Clinical Electrophysiology (PACE) journal (Evans, J. M., Withers, K. L., Lencioni, M. , Carolan‐Rees, G. , Wood, K. A., Patrick, H. and Griffith, M. (2019), Quality of Life Benefits from Arrhythmia Ablation: A longitudinal study using the C‐CAP questionnaire and EQ5D. Pacing Clin Electrophysiol. Accepted Author Manuscript. doi:10.1111/pace.13675). James carried out the work whilst working at Cedar. The study presents results for generic and arrhythmia related quality of life using patient reported outcomes gathered at baseline, post-ablation and at 1 year follow-up. Results showed significant improvements in symptom severity, impact on life scores, EQ-5D-5L indices and VAS scores at baseline versus three months (post-ablation) and at baseline versus 1 year follow-up. Impact on life score showed additional improvement at 1 year follow-up versus three months, while improvements in symptom severity, EQ-5D-5L indices and VAS scores continued to be maintained between 3 months and 1 year follow-up. Cardiac ablation therefore provides patients with arrhythmias relief from symptoms, and results in an improvement in quality of life. SMTL are pleased to announce the availability of a new test method for pulp products used in healthcare, to BSI "Product Assessment Specification PAS 29:1999 Disposable pulp products for use in healthcare". Please contact SMTL as below if you want a quote. Since the first British Standards for compression hosiery were published in the 1980's, the use of compression garments to treat various clinical complications has changed significantly. Performance requirements and test parameters which seemed appropriate 33 years ago are now causing confusion for users of the products and operational difficulties for test houses and manufacturers. To address these issues a new standard - BS 661210:2018 - has recently been published. 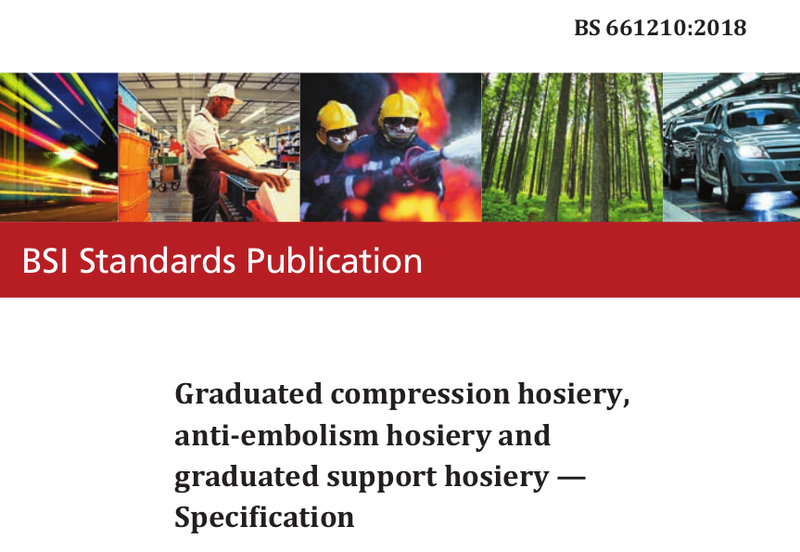 BS 661210 is a revision and merger of three previous standards (BS 6612:1985, BS 7563:1999 and BS 7672:1993) for graduated compression hosiery, anti-embolism hosiery and graduated support hosiery. The BSI Panel took the opportunity of the revision to address inconsistencies in the previous standards, clarifying various test parameters and technical issues, and producing a single consistent test method to test both medical and non-medical compression garments. As well as specifying the test method, the Standard sets out performance requirements for the compression and stiffness of these devices, and these have been updated to reflect current clinical UK guidance . A new informative Rationale Annex (Annex C) has been included to explain the thinking behind most of the major changes in the Standard, and another new Annex (Annex D) explains the variety of classes and compression profiles used in the UK that are referenced in various standards and clinical guidance documents. Peter Phillips (Director of SMTL) is chair of BSI committee CH/205/1, under which the Panel operated, and Dr Gavin Hughes (Deputy Director, SMTL) acted as Editor of the standard.